Prosciutto is a raw, unsmoked ham, that is cured by dry-salting for one month followed by air-drying in cool curing shades for half year or more. It’s golden-pink in colour and is always eaten uncooked. True prosciutto is called Parma ham, and is made in Parma, Italy, but many versions are prepared elsewhere, in and outside Italy. 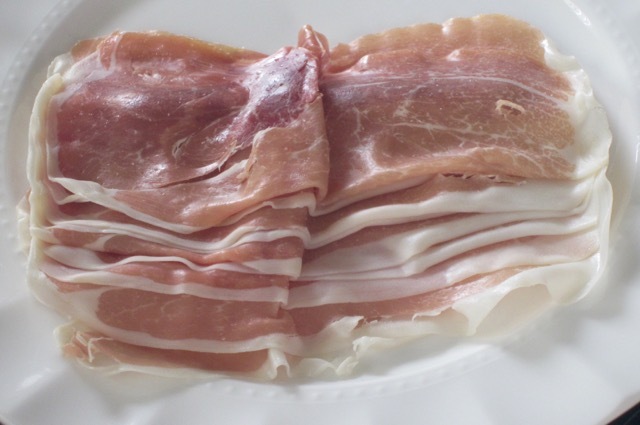 Parma ham is called Prosciutto di Parma. Prosciutto is cut into tissue-thin slices and is usually served with figs or melon, or added to cooked dishes at the last minute. It is also eaten as accompaniment to cooked spring vegetables, such as asparagus or peas. Other Italian prosciuttos are labeled according to their city or province of origin, for example, Prosciutto di San Daniele or Prosciutto di Modena. 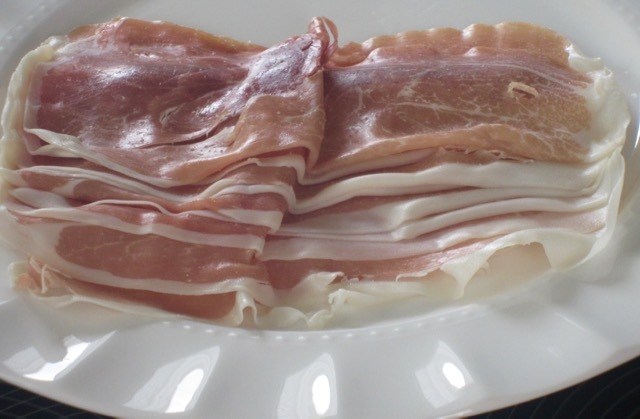 San Daniele is produced in much smaller quantities than Parma ham, so it’s more expensive. Storage: store in the fridge until sell by date. Once opened, consume within a few days. Prev What is a Utility Turkey? I love this photo of yours. How is Chicago and the Spicy Peperoncini Oil of Italy? It looks very attractive. Thanks for the tons of likes and all the messages. Life is kinda busy here and rather cold. Have a lovely week! I have never friend it but I’ve had it on pizza and it was awesome. Prosciutto is one of our absolute favorite foods in the deerslayer household. We’ve been thinking about trying our hand at charcuterie just so that we can try to make prosciutto. By the way, we also checked into the price of the special meat slicers that are required for those wonderful paper thin slices.$$$$$$! Thanks for the post. We’re still at the “wishful thinking” stage. We’ve watched the videos and bought the charcuterie books. I’ll keep you posted once we finally get the nerve to try it. I really look forward to. I totally love your enthusiasm. I wish you all the best.